This Chandra image of the supermassive black hole at our Galaxy's center, a.k.a. Sagittarius A* or Sgr A*, was made from the longest X-ray exposure of that region to date. In addition to Sgr A* more than two thousand other X-ray sources were detected in the region, making this one of the richest fields ever observed. 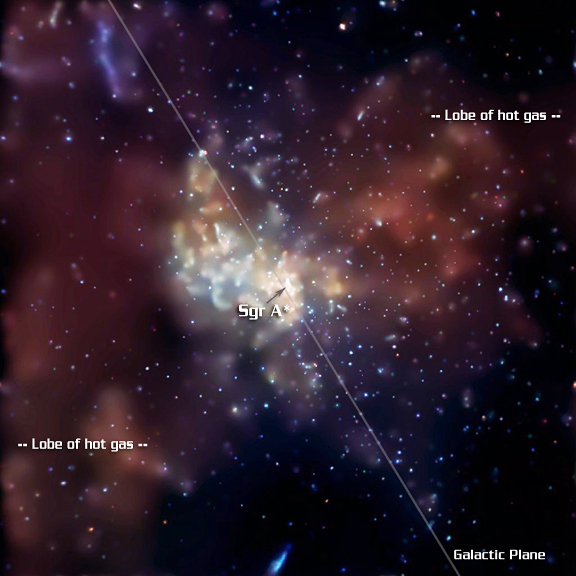 Evidence for such explosions was revealed in the image - huge lobes of 20 million-degree Centigrade gas (the red loops in the image at approximately the 2 o'clock and 7 o'clock positions) that extend over dozens of light years on either side of the black hole. They indicate that enormous explosions occurred several times over the last ten thousand years. Scale Image is 8.4 arcmin on a side.